The UBIQ freestanding magnetic display systems are being used in hotels throughout the UK and offer the most flexible way to have beautiful free standing/mobile signage with the ability to change the promotional messages immediately or multiple times throughout the day, week or month. With the ability to easily update any images or graphics and message directly to your customers and patrons, it’s that simple! The magnetic system is strong yet easy to add or remove the tiles. Plus it has the added functionality of shelves and leaflet dispensers and other accessories that the pull up banners cannot offer. With F & B and the full time advertising of the hotel’s services, restaurants and forthcoming events, to have a display system that really works for you is unique, with guaranteed upsell proven in many hotels. 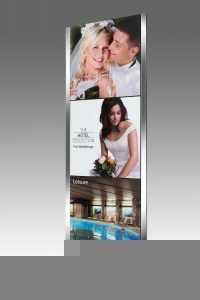 Hotel occupancy rates have been increased in hotels where our Reception Displays have been used. Although the main push would be to attract the staying guests to the bars/restaurants on offer within the hotel increasing revenue by making guests spend more during their stay. Our hotel portfolio includes ‘The Hotel Collection’ ‘Ramada Jarvis’ ‘Mercure’ and many other chains or independents.